So much for unsuccessful baby knitting (that baby, my cousin's, is now getting a Mason-Dixon Mitred Square baby blanket -- hopefully before his first birthday!)..... 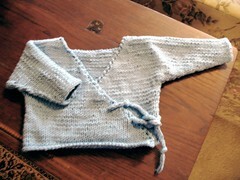 here's some successful baby knitting, a baby kimono, also from Mason-Dixon Knitting. 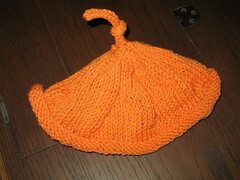 This is for a friend's baby boy, born last Friday. This is a truly awful photo. The baby kimono is quite cute. Instead ribbons, I used I-cord for the ties -- more manly, you know. Although the pattern doesn't call for it, I also attached inside ties, made from crocheted chains.